First I want to thank everyone who left a suggestion for the holiday pattern. They were all great ideas, and I definitely want to work on some of the others I didn't get to this year (especially the merry wombat! I tried, but it needs more work than I had time for). 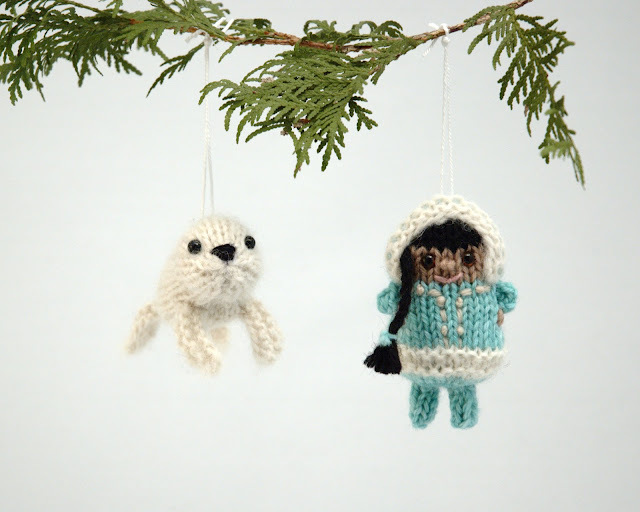 In the end, I decided on making the Eskimo, or Inuk, and a baby seal (which was suggested by Mr. Mitten when I couldn't get the merry wombat to turn out right). Below you'll find the instructions for both, with the abbreviations following, if you're unfamiliar with some of the terms. I hope to get the pattern published as a PDF as soon as Mr. Mitten has time to help. I've tried to design these toys to be simple and fast, so you can make a set in an evening. I've designed them in worsted weight yarn because I always have lots around, but you can easily knit them in a different weight with appropriate sized needles. (Note: changing to finer yarn will make the toys appear slimmer, changing to thicker yarn will make the toys appear plumper). The pattern is advanced beginner to intermediate level, and you will need to know how to knit, purl, increase, decrease, change yarns, make bobbles, work I-cord, and sew seams. However, these all make the toys fun and interesting to knit, and small toys are a great way to learn new skills! CO 9 sts with MC. Row 5: P 1 row. Switch to fuzzy yarn on next row. Row 7-9: K 3 rows. Switch back to MC yarn on next row. Row 10-11: Beginning with a k row, work 2 rows in st st.
Row 13: P 1 row. Row 15: P 1 row. Row 16: k6, mb, k8, mb, k6. Row 17: P 1 row. On next row, switch to light brown yarn. Row 19-21: Work 3 rows in st st.
On next row, switch to black yarn. Row 22-23: Work 2 rows in st st.
Row 25: P 1 row. Cut yarn leaving a long end, thread end through remaining stitches and pull tight to gather. Attach safety eyes. Sew back seam down to garter-stitch section. Stuff body. Thread yarn through cast-on stitches, gather, then sew last bit of seam. Weave in yarn ends. You may need to make a couple small stitches around bobble arms to close any holes. Embroider a face and hands. For a girl, add braids for hair. These embellishments can be as simple or as creative as you like. Start at front. CO 16 sts with fuzzy yarn. Row 1-3: Knit 3 rows in garter stitch. On next row, switch to MC yarn. Row 4-5: Beginning with a k row, work 2 rows in st st.
Row 7: P 1 row. Row 9: P 1 row. Row 10: k3, k2tog, k2, ssk, k3. (10 sts) Bind off, or graft back of hood together. If you bound-off, sew a vertical seam at the back of the hood. Weave in yarn ends. Sew bottom edge of hood to toy, just below the neck. If you are hanging the toy, thread the ribbon or cord through the top of the hood, and tie a knot. CO 5 sts with MC yarn onto one double pointed needle. Work I-cord for 4 rounds. Bind off. Sew the bound-off edge of legs to bottom of Inuk. Weave in all yarn ends. Start at tail. CO 6 sts with cream yarn. Row 9-13: work 5 rows in st st.
Row 16: k1, k2tog, k7, m1, k2, m1, k7, ssk, k1. Row 19-23: work 5 rows in st st.
Cut yarn leaving a long end, thread end through remaining stitches and pull tight to gather. This is the nose end. Insert safety eyes on head. Sew up seam along underside of body, leaving an opening. Stuff and sew closed. Most of the head shaping is done with the stuffing, adding extra bits to the cheeks and nose. You can also try some soft sculpture for more definition (although baby seals are really cute cute fuzzy blobs!) If you are hanging the toy, thread the ribbon or cord through the back of the neck, and tie a knot. Bind off. Fold in half lengthwise and sew together short straight edge. Sew 2 flippers to tail, with decreased edges facing out, and cast-on edges facing toward the head. Sew other 2 flippers to sides of body near the head, in the same orientation as the tail. Weave in yarn ends. Posted by Barbara Prime at 12:30 a.m. These look so cute - you are so generous to offer them free. November 23, 2012 at 9:45 a.m.
Awww, thanks for attempting my merry wombat idea! November 23, 2012 at 9:48 a.m.
Lovely! :) I hope I get a chance to make these, they are so very cute! November 23, 2012 at 10:20 a.m.
Where can I buy the safety eyes used on these cute decorations? November 23, 2012 at 10:26 a.m. So cute!!! Thank you very much for the free patterns!!! November 23, 2012 at 11:01 a.m.
My siblings and I used to sell Christmas and Easter Seals as a charity fundraisers at our little school many years ago. I can't wait to surprise them with their very own Christmas Seal to put on their trees. I wonder if they'll remember? November 23, 2012 at 3:53 p.m.
How cute! I love how I will be able to colour coordinate this with my chritmas decorations, white, lilac and purple. I will definately make some off these cuties! November 23, 2012 at 4:24 p.m. Absolutely beautiful! Thank you so very much for your kind generosity!! November 24, 2012 at 5:24 a.m.
You can find safety eyes on Etsy. Just search for "safety eyes" under supplies, and you'll find lots of options. November 24, 2012 at 1:01 p.m.
ADORABLE - thank you so much Barbara! November 28, 2012 at 2:21 p.m. 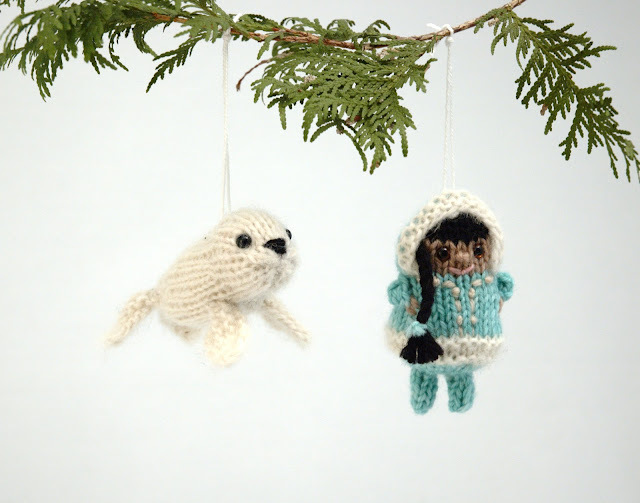 Both are adorable, but I am so thrilled to find a seal ornament just in time for Christmas! 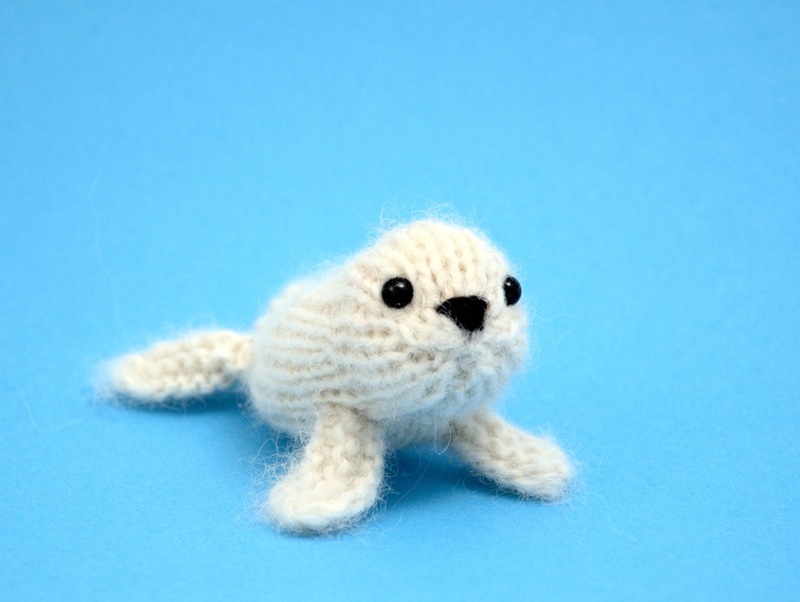 My daughter has requested a knit seal for Christmas, and the tinier the better. Just adorable, I cannot wait to cast on tomorrow! November 29, 2012 at 10:11 p.m.